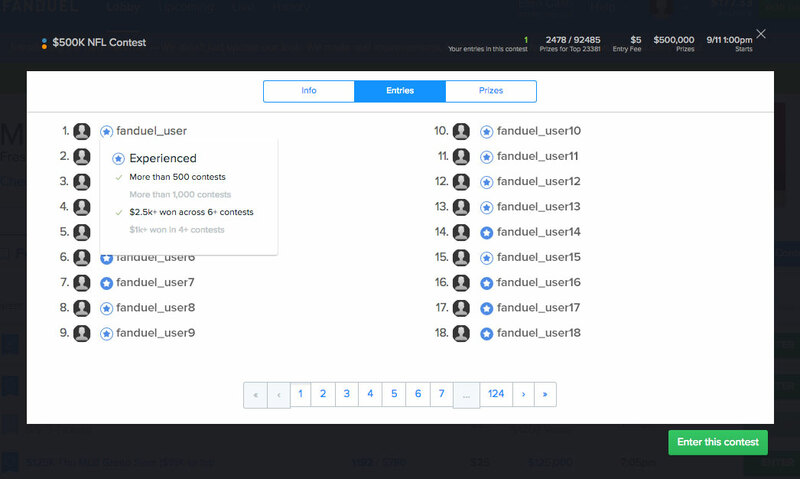 We now recognize the most accomplished FanDuel players with one of two special indicators — “Experienced” or “Highly Experienced.” It’s a quick way to scan the players who’ve already entered into a contest and see who you’re up against. If you see a ‘star’ icon next to any FanDuel player’s username, it represents a significant amount of contests played or money won. The icons above correspond with each level of experience. To see a list of players who have entered a FanDuel contest (including those designated as Experienced or Highly Experienced), follow the ‘Entries/Size’ link from the FanDuel Lobby — or, you can select ‘Entries’ from the ‘Contest’ screen. We measure experienced based on two criteria: 1) total contests played on FanDuel and 2) how many big wins you’ve brought home. Hit either threshold and we’ll label you as an Experienced or Highly Experienced player. Check out the specific milestones for each tier of FanDuel player below.